Besides killing the 2015 NHL Entry Draft, the Winnipeg Jets summer has been very quiet. To some, too quiet. Currently the Jets are heading towards the season with only 22 signed who were regular roster players for most of last season, with a few of those being possible depth options sent to the Manitoba Moose. 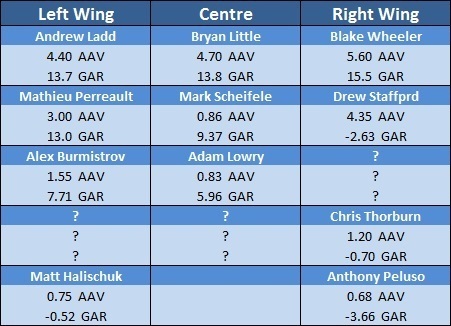 The most apparent holes seem to be the ones left by the departure of Lee Stempniak, Jiri Tlusty, and Jim Slater. However, this has given some Jets an opportunity to earn their keep in the NHL. Let’s take a look at some potential NHL rookies who will be battling for a roster spot this September and October. AAV is average salary for duration of contract and also cap hit. GAR is a holistic stat looking at total player value given from 2011-2014, with these numbers being indexed to per 82 games. As it stands, there are nine forwards who are all but guaranteed a regular job this coming season. Maurice noted that there is a lot of roster fluidity in possible line combinations. This is especially true with the addition of Alexander Burmistrov, who has played all three forward positions in the NHL previously. Unless the Jets move Burmistrov to centre –likely pushing Adam Lowry to the fourth line– the Jets are looking at one top nine forward position to fill, likely on the wing. It does not appear that the Jets have penciled in Matt Halischuk, Chris Thorburn, or Anthony Peluso, so the spot remains open to the best rookie in camp. PCS% is percentage of closest statistical cohorts who make the NHL for 200+ GP. PCS P/82 is the points per 82 games of the statistical cohorts that made the NHL. NHLE P/82 is the NHL equivalent of the player’s non-NHL scoring per Rob Volman’s numbers. The easiest way to explain Armia to those that have never seen him before is the AHL version of Blake Wheeler: tall, tonne of skill, nice hands, pass first winger, skates fast for his size, and a bit inconsistent. Armia posted elite scoring numbers for his age in the Liiga in his draft season and the next few years, earning himself quite the reputation. Last season Armia struggled to score on a very weak St. John’s IceCaps squad, although he performed well while with the Rochester Americans. Due to a slump with the IceCaps, Armia’s numbers likely under appreciate his skill. Armia definitely will be competing for the Jets top-nine winger spot. There were many who thought Petan looked strong enough to play in the NHL last pre-season. Petan looks to push once again. Like Armia, Petan had an uncharacteristic scoring slump. Although, a scoring slump for Petan was only slightly scoring over a point a game prior to the World Juniors. After a strong showing in Toronto and Montreal, Petan came back to the Dub and lit the league on fire, followed by a very strong performance in the playoffs. While Petan’s skill sets fit him best as a centre where he likes to slow down the play, Petan has stated he is open to playing a role with the Jets on the wing. Ehlers finished off one of the most dominant individual performances the QMJHL has seen in quite some while leading many to believe Ehlers has nothing more to prove in junior. His numbers for the 2014-2015 season were quite exceptional. Ehlers helped carry the Danes to their first World Junior win ever and also lead the QMJHL in playoff scoring, despite being eliminated in the second round. Ehlers also connected on over 60 per cent of his team’s scoring, the highest amount of any player in the CHL. Any of the three previously discussed players could end up forcing their way on to the Jets fourth line if they do not make the cut for the coveted top-nine spot. There they will find a few more competitors looking to make the team, as well as the Jets depth forwards Halischuk and Peluso. While Copp hasn’t put up the numbers in the NCAA that safe bets tend to do, Copp carries many of the other factors –both intangible and tangible– that scouts like to see in their bottom pieces. Copp captained the Michigan Wolverines while playing on their top line for much of the past three seasons. While he never exceeded a point per game, Copp wavered close most of his career. The young centre comes with the size, skating, and defensive acumen teams wish to have in their bottom line, while still carrying some scoring upside. Cormier is an older depth player and not a prospect, but has been a depth call up for a few years now. While not optimal, Cormier will provide competition to the Jets fourth line centre position and is a “Plan B” if Copp turns out not to be ready. Kosmachuk carried a very similar season last year as the Jets’ Adam Lowry did the year prior. He started off slow, but picked up the pace in the later half of the season. The young, hard-nose winger is a goal scorer through-and-through. Kosmachuk has been one of the top goal scorers for his age group throughout his career. He likes to drive to the net and won’t back down from the opposition. Lipon’s scoring numbers dipped with the IceCaps changing from one of the league’s top teams, to one of the worst teams. Still, Lipon was able to impact his team and provide some value. Lipon will never be one to score a slew of goals, but he does carry bottom six potential. While Kosmachuk is very much a goal scorer, Lipon is very much a playmaker. Lipon has a very solid pass and decent vision for a NHL fourth line player. Lipon is also fearless. While not being the largest player on the ice, he has a lot of bite to his game. He will need to develop into an atagonizer and curve his style into one that draws penalties more than he takes, if he wants to be a plus fourth-line player in the NHL. You know, moving Stafford down to the third line has potential. The Scheifele/Stafford combo was a tire fire last year – most of that I place on Stafford. Moving Stafford down to a bit more of a sheltered role working with two younger guys makes a lot of sense. Place any of Armia, Petan or Ehlers on the 2RW and watch him light it up.